The competition was organized by the Warsaw Stock Exchange. The biggest Polish banks and financial bloggers were partners. Participants competed on futures market with an online demo platform to win real money. They were supported by mentors (analysts from banks and trading firms) who were sharing their market insights. We were responsible for the overall project: UX & design, photo shoot, web production, media buy, SEM & SEO, social buzz. Futures Masters competition, organized by the Stock Exchange and the Central Securities Repository, has kicked off. It was addressed to all investors - regardless of level of advancement - interested in futures trading. Twelve biggest polish financial blogs influencers were partners of the event. For the time of the contest each partner was promoting event with landing pages and banners on their websites. 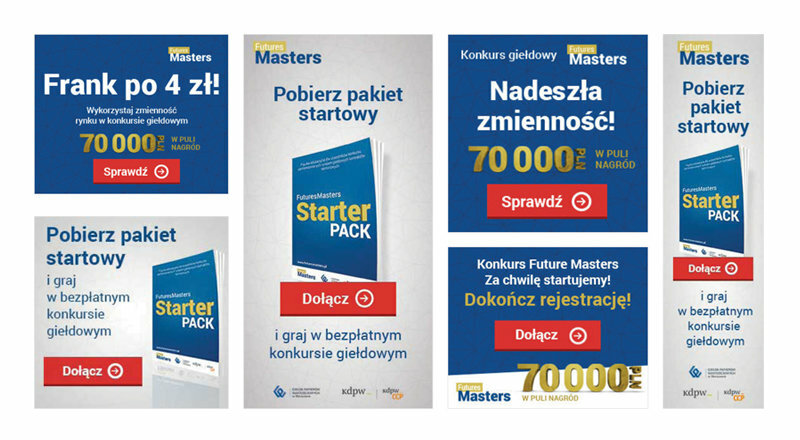 The Warsaw Stock Exchange commissioned us to prepare and run a campaign promoting investing in futures. In addition, the campaign was to attract new investors and at the same time present the rules of the futures investment game in an interesting and educational way. 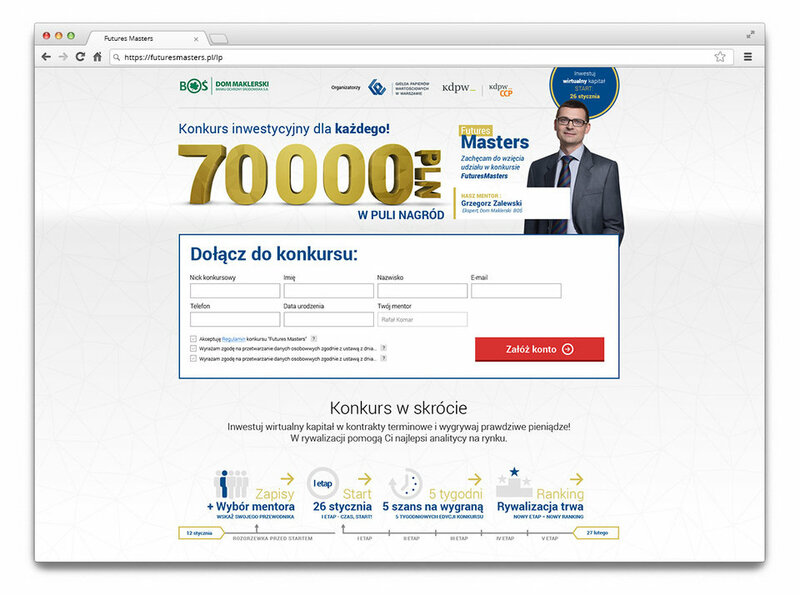 Our concept included complex organization, communication, implementation and coordination of an investment contest. Direktpoint being the main contractor was responsible for the whole project: among others, for the design and production, implementation of the competition website, media purchase, communications as well as the project coordination. One of the landing pages with application form. 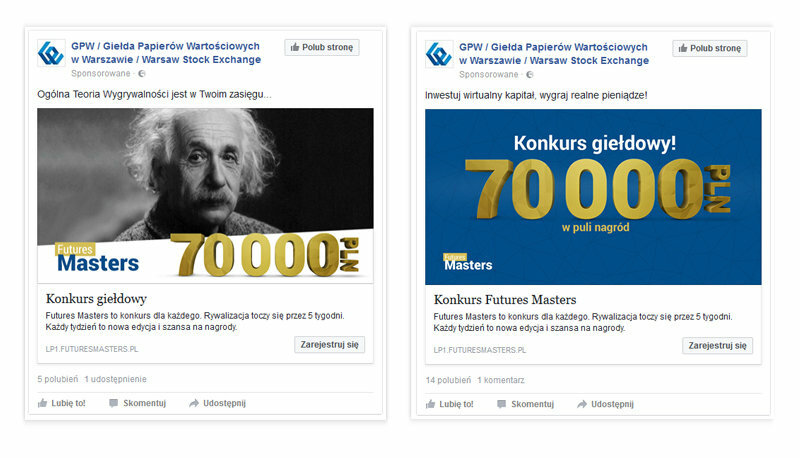 Examples of the facebook ads. We have used two visual lines to promote the contest, based on historical pictures and original contest graphics. Participants use a demo platform investing virtual capital, and they win Real Money in each of the five weekely editions. Investors are supported by Mentors - financial analysts from leading brokerage houses and banks in Poland - sharing their insights and experience. Among the Partners of our contest there were 11 leading Polish brokerage houses and banks and each one named their representative - Mentor. We were responsible for full coordination of organization of the brokerage houses’ activities. Each Mentor was given access to CMS of the contest page which enabled them to communicate directly with contest participants. Education package was an e-book designed for every contest participant. With the help of experts from the Stock Exchange we have prepared an educational “package” for people interested ininvesting in stock exchange futures. Starter Pack included information useful to investors of different levels of advancement. It helped improve navigating in the futures environment and showed options preventing against possible loss. We received a great support from the side of the client - a designated workgroup was coordinating our work. Also co-promoter was Krajowy Depozyt Papierów Wartościowych, which is a central infrastructure institution responsible among others for the management and supervision of the depository. 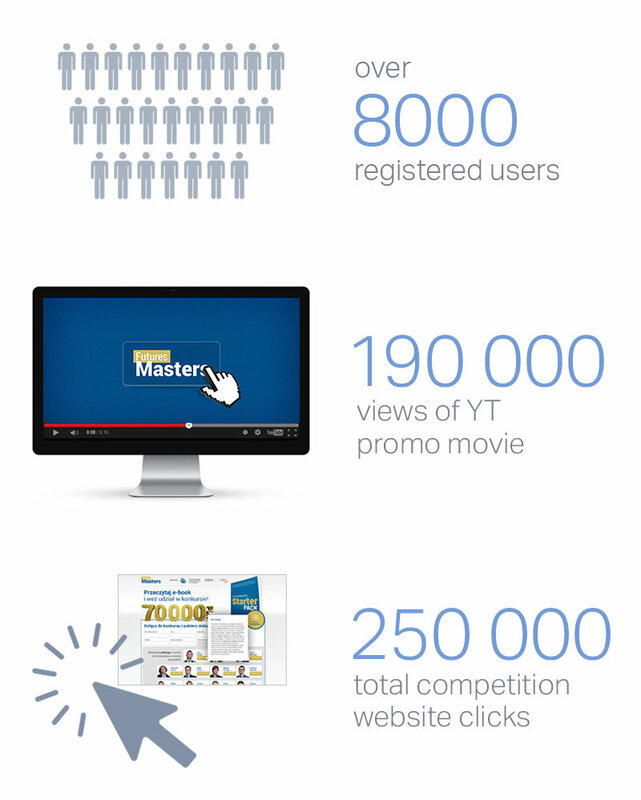 Extensive adwords and other media networks campaign was conducted. For every stage of the contest we have changed visual line of the banners and used other tricks to keep convertion rate high. Contest partners were the biggest polish banks, brokerage houses and financial institutions.